DALLAS, TX — Heritage Auctions, the official auctioneer of the Florida United Numismatists (FUN) Show, will conduct a 4800+ lot Currency Signature Auction, Jan. 7-11, 2010 at the Orange County Convention Center, 9400 Universal Blvd., Orlando, FL. The Convention Center is also the site of the FUN show, as well as the location for lot viewing for the CAA auction and the other Heritage auctions at the event. Of the 4800+ lots, 1300 will be part of the non-floor session to close online on Monday January 11, 2010 starting at 12pm CST. The four day auction will commence on Thursday evening, Jan. 7 at 6 p.m., with an array of Colonial Currency, Obsolete Bank Notes, Confederate Currency, and Canadian and World Currency. The Colonial Currency offering is again significant with major rarities including, a Vermont February 1781 2s6d PCGS Apparent Very Fine 30.
and from Maryland, Cumberland, MD- Cumberland City Bank $5 G2 Shank 30.4.3P Proof. and a chartered bank note rarity, Halifax, NS- The Bank of Nova Scotia $100 1929 Ch # 550-28-40. The Cocoa Beach Collection anchors the second session and is the largest and finest offering of Fractional Currency since the Thomas O’Mara Collection was offered by Heritage in 2005. Many of the notes have pedigrees tracing them to the O’Mara and Milt Friedberg Collections. and a stunning Fr. 1296 25¢ Third Issue PMG Superb Gem Unc 67 EPQ stand out. The Cocoa Beach Collection also features three beautiful shields, including a very rare and very high grade pink shield, Fractional Currency Shield, With Pink Background. This session also includes a nice sampling of Encased Postage and Military Payment Certificates. The afternoon of Friday Jan. 8 at 2 p.m., Small Size Currency and Error Notes will be offered. It is anchored by the Rocky Manning Collection, five ultra high denomination notes, and more than two dozen $500 and $1000 Star Notes. and a never before offered Richmond Fr. 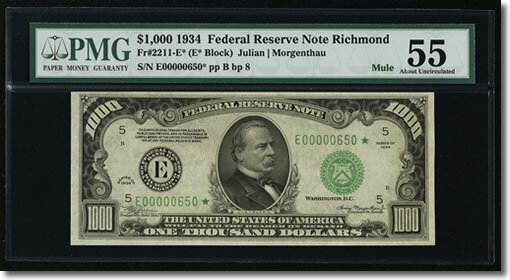 2211-E* $1000 1934 Federal Reserve Note. PMG About Uncirculated 55. Friday evening’s session begins at 7 p.m. and includes about 800 National Bank Notes highlighted by selections from the Don C. Kelly Collection of Ohio National Bank Notes. Kelly is the esteemed researcher and author of National Bank Notes, A Guide With Prices, the authoritative reference on the subject, used extensively by collectors and dealers since it was first published nearly three decades ago. and a Denver, CT – $20 Original Fr. 427 The Colorado NB Ch. # 1651. And a Fr. 1217 $500 1922 Gold Certificate PMG Choice Very Fine 35 EPQ. Heritage Auctions, headed by Steve Ivy, Jim Halperin and Greg Rohan, is the world’s third largest auction house, with annual sales more than $600 million, and 475,000+ registered online bidder members. For more information about Heritage Auctions, and to join and gain access to a complete record of prices realized, along with full-color, enlargeable photos of each lot, please visit www.HA.com. Want to get the up-to-the-minute updates and breaking news stories about Heritage Auctions? Get them as they happen at: www.Twitter.com/HeritagePress; www.Twitter.com/JimHalperin; Facebook: Heritage Auction Galleries.